The latest version of MSP430-GCC was released early this year and is now maintained by SOMNIUM Technologies. The lesson on building the toolchain has been updated to work with this release. Before the C programming language was created and engineers programmed in assembly, optimizing code was a big part of the daily routine. Today, optimization is less the job of the engineer as it is the responsibility of the compiler. Most will agree that when writing code, readability and maintainability takes precedence over fancy or confusing optimizations. Engineers should only take optimization into their own hands when absolutely necessary. Modern compilers are much more intelligent than they used to be and are able to make ‘decisions’ on how to optimize code for speed and size. To help compilers with some of these decisions, the C99 standard introduced the inline keyword which suggests to the the compiler that the body of that function should be placed inline wherever it is called. What does this mean? Let’s take a deeper look. C provides us with many different ways of reusing a common piece of code. Functions are the most obvious that come to mind, but there are also macros and gotos. Each have their own advantages and disadvantages. Functions are the safest option as the have typed arguments and return types and provide the best modularity of code. However they do have disadvantages. Functions have the highest overhead and therefore the greatest impact on performance. Having a lot of small functions is great for readability and structuring of code, but each function call will produce several instructions of additional code which consumes memory and CPU cycles. This is because every time a function is called, the function arguments must be loaded into registers (and/or the stack), the address of the next instruction is stored on the stack (so the processor knows where to return to) and finally jump to the function. Inside the function, stack space must be allocated and the arguments removed from registers and placed onto the stack. Local variables are also stored on the stack. Similarly, when exiting a function the stack has to be freed, the return value stored in a register, and then jump back to continue from where the function was originally called. To be fair, this seems seems like a huge process, but really it will boil down to a handful of instructions depending on the function and architecture. Nonetheless, if you are trying to write a complex program with hard real-time deadlines, it can have an impact on the ability to meet those deadlines. A common ‘solution’ to these issues is to use macros instead of functions. Code defined by a macro is always executed inline. The precompiler searches the translation unit (C file) for instances of the macro name and replaces them with the defined code. This makes macros much faster and efficient in general than functions because there is no overhead, require no additional stack space and and can be better optimized by the compiler. Macros are not typed making them more flexible, but this can also be a double edge sword. Multi-line macros are more difficult to read than functions, and there are are other caveats like side-effects, cryptic compiler errors, and code bloat. Code bloat is when macros are scattered everywhere throughout the code. Since the same code is repeated over and over again each time the macro is called, additional program memory must be allocated. For example, if a macro compiles down to 10 bytes of machine code and is used 1000 times, that’s 10000 bytes of program memory required. If a function was used instead, there might be some function overhead, but the body of the function would only occupy 10 bytes of program space. Finally, macros (specifically function-like macros) are often frowned upon my many coding standards. The general rule of thumb is use macros to replace functions only when performance is an issue. However this is a broad generalization, and when a code base becomes big and complex, it may not necessarily be the best solution. When C99 introduced inline functions, it tried to address the caveats of both functions and macros providing the best of both worlds while catering to the increasingly complex code being produced. Inline functions provide all the benefits of a normal function, but leave it up to the compiler to determine what is the best way to optimize the code – i.e. to inline or not to inline. This is based on a number of code characteristics as defined by the compiler algorithm and the compiler optimization level used. Inline is a keyword just like static or volatile. The difference with the inline keyword is that it is just a suggestion to the compiler. It does not have to inline the function just because a function was declared as such. By pointing out which functions the compiler might want to optimize, the compiler knows which functions to focus its optimization efforts on while keeping compilation time to a minimum. Until you have no other option, trust the compiler to do it’s job and let it optimize your code as much as possible the way best that it can. Now let’s create a simple test function. Say we want to find the maximum value in an array of integers. In our test code, the array will be extern’d rather than defined in the same file. This is because if the compiler can see the array, it can optimize based the initialized values. The test function will traverse the array and compare the current maximum with the current element and store the greater of the two in a variable, which will be returned to the caller. The variable max_value is initialized to the first member in the array, so we start iterating from index 1. Each iteration the higher value will be stored in the variable max_value. We start off by compiling the code compiled as regular function. Optimizations should be turned off by passing the argument -O0 so that the compiler doesn’t automatically inline our function (the compiler might inline your function even if its not defined as an inline function if optimizations are turned on). 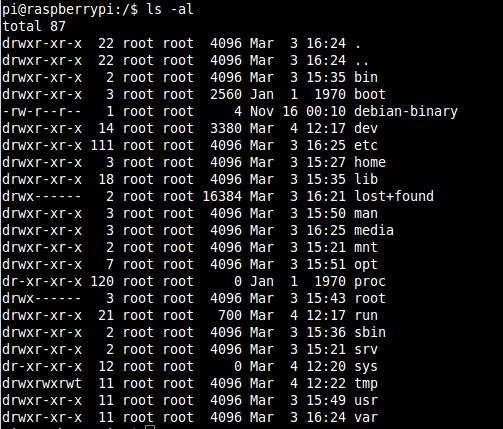 This can be confirmed using the objdump utility and look at the disassembled output. Let’s take a look at the output in greater detail. Our first consideration is performance – i.e. speed – the less instructions / CPU cycles the better. 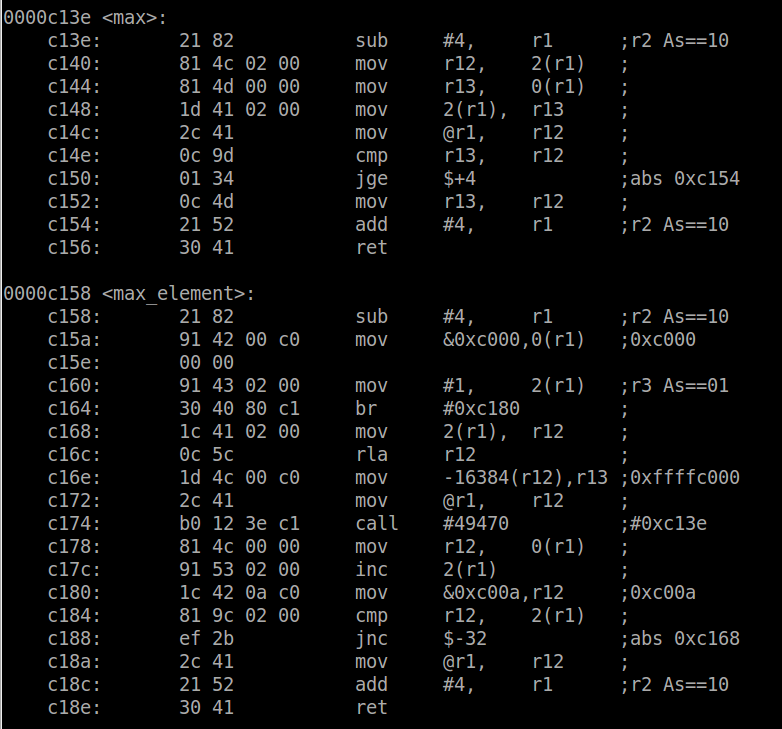 We can see where the max function gets called because the call instruction is invoked and has a destination with the address the same as max (0xc13e). The two mov instructions prior are filling r12 and r13 – setting up the function arguments. The call instruction is not actually a single instruction – it represents two operations and consumes several CPU cycles (4-5). This includes saving the address of the next instruction on the stack (the one to return to) and then branching to the max function. Inside the max function, we have the overhead of the creating the stack and saving the two arguments to it (the first three instructions) and then at the end of the function the last two instructions are freeing the stack used by the function and then jumping back to the saved address before the call. This also consumes several CPU cycles. Actually calculating the overhead would required doing some research to find how many CPU cycles each instruction takes and then adding them up. That is beyond the scope of this post, so to perform an example calculation of overhead let’s say there are 15 additional CPU cycles required for function overhead. If the array is only 5 elements long, the overhead would consume 75 CPU cycles. Not a big deal right? But what if the array was 1000 elements. That would be 15000 CPU cycles. Executing this function once a second with a 1MHz CPU clock would result in 1.5% of the CPU cycles being used for this one function’s overhead! The other characteristic we have to investigate is the size of the code image because that will determine how much memory (flash in the case of the MSP430) is required. Using the objdump utility to view the section headers (passing the argument -h), the size of the compiled code which is defined by the .text section is 0x284 (644) bytes. Keep in mind this size is for the whole image, not just this one function. The first thing to note is that the max function is gone altogether, as expected. The code defined by macro has become part of the max_element function rather than a separate function. We can see the actual comparison occurs where the cmp instruction is invoked, similar to how it is implemented in the max function above. By comparing the number of instructions in these two examples, it is safe to say we will benefit from a pretty significant performance improvement using the macro. 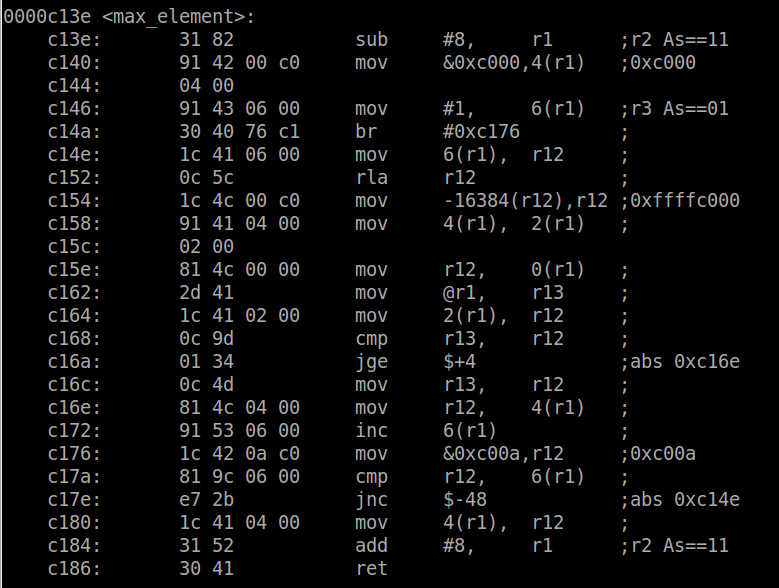 In terms of code size, it has reduced quite a bit down to 0x26c (620) bytes. Of course this is expected only because the macro is called once. If it was called several times, the code size would start increasing. Interestingly, it is not as efficient as the macro. There is still some overhead, possibly because the compiler inserts the inline function after both are compiled and therefore has to add some glue code. The code size has also increased to 0x27c (636), 16 bytes more than the macro, but still 8 bytes less than a regular function. Therefore, it appears that inline functions are less efficient than macros. To see if we can make the inline function as efficient as the macro, let’s turn on optimizations. Recompiling the same code with the -O2 option instead of -O0, we can see that both the inline function and the macro result in the same generated machine code, and are therefore equally efficient in terms of performance and space. No need to paste the same code twice, take my word for it or try it yourself and you will see that they are the same. Keep in mind that just because in this example the generated machine code turned out to be the same, this may not always be the case. Optimizations use very complex algorithms and the optimal solution could change based on many variables that might not be easily spotted by basic analysis. If we wanted to optimize for size instead of speed, we would use the argument -Os. In this example, the compiler will still inline the function because it is small and called only once. However, if the function was bigger and used in many places, the compiler may choose not inline the function. All in all inline functions are a great tool to have. In fact, inline functions proved to be so useful that most compilers support them in C90 mode with extensions. Modern compilers are very advanced and will most likely do the best thing regardless whether a function is declared inline or not. However it doesn’t hurt to make the suggestion – the worst case is the compiler ignores you. +1 C99 for introducing inline functions. In C, the initialization of structures can be dangerous if the structure definition ever changes. When a structure is initialized, the order of initializers must follow the structure definition otherwise the members will be assigned the wrong value. This may seem trivial, but take the following example. You have a module which is controlled using a message queue. When the module is first written, the message takes the following simple form. Several years later there is an urgent need to add a priority to the message. Someone comes along and hastily modifies the structure to add the new member. But they add it in middle of the structure… The existing initializations will still compile without error since the second member in both the old and new structure definition – priority and length respectively – have the same data type. As long the types match, the compiler has no way of knowing that the structure has changed and is now no longer initialized correctly. Only if the types are different and all the strict compiler checks are enabled will it throw an error if say, a uint32_t is assigned to a uint8_t. Even if existing code does not require this new member, the initialization will still be wrong. Developer testing or a code review might catch this type of error, but it would be even better if it could be avoided all together. C99 introduced a new feature to address this called designated initializers. It is a way to explicitly initialize a member using a new syntax. The function to send a write message could be instead written to take advantage of this syntax. The member name is prefixed with a period (.) and then assigned the initializer. In the example above, the existing initialization code is still correct after the structure definition was updated. Therefore a structure can be changed without having to update all the initialization code if the new member is not required. So there are two advantages here: 1) it is safer, and 2) it can lead to more efficient development. This feature also applies to arrays. Let’s say each message has a handler function. If the message IDs are mostly consecutive, the easiest and often most efficient implementation is to define an array of function pointers. A dispatcher then reads the incoming messages and invokes the appropriate handler. Defining the array of message handler seems pretty trivial. However, this is because there are only two messages in this example. If you had 100 messages, keeping track of which handler goes where in the array can be difficult. How do you verify that the handler is at the right index in the array without manually counting? Especially when you may be implementing the handlers out of order. Well, designated initializers in C99 can help here too. 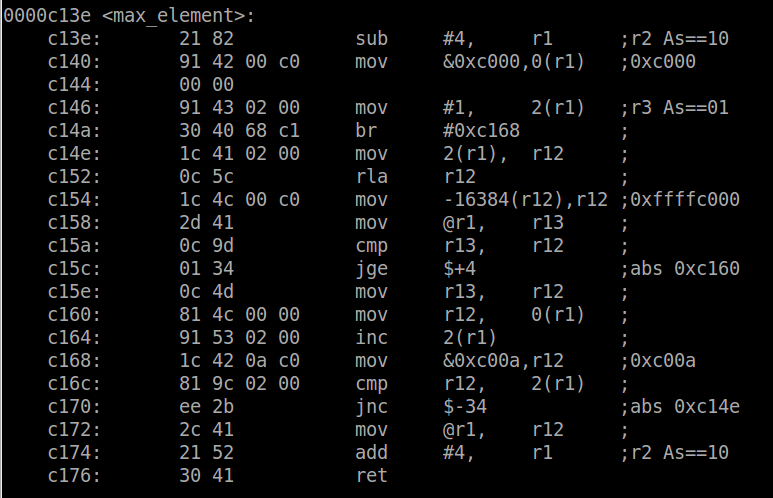 Just like with the structures, we can tell the compiler at which index the initializer is intended for. The nice thing about this syntax, is that the array doesn’t have to be initialized in order or even consecutively anymore. And since it explicitly states which index (or in this case message) the initializer is intended for, it makes it easier to read with really big arrays. However you do have to be careful since you can inadvertently create a really big array for no reason. For example, if the first message ID is non-zero and starts at 200 instead – i.e. MSG_ID_READ = 200 – using the ID as a designated initializer will force the compiler to allocate an array of 202 elements, even though the first 200 are unused. This is obviously undesirable, and you might consider using an offset instead of the actual message ID. Overall, designated initializers in C99 are a definite improvement over C90. Being able to initialize both structures and arrays explicitly can improve the readability and maintainability of your code. And with that, I believe that brings the score to C99:2 – C90:0. 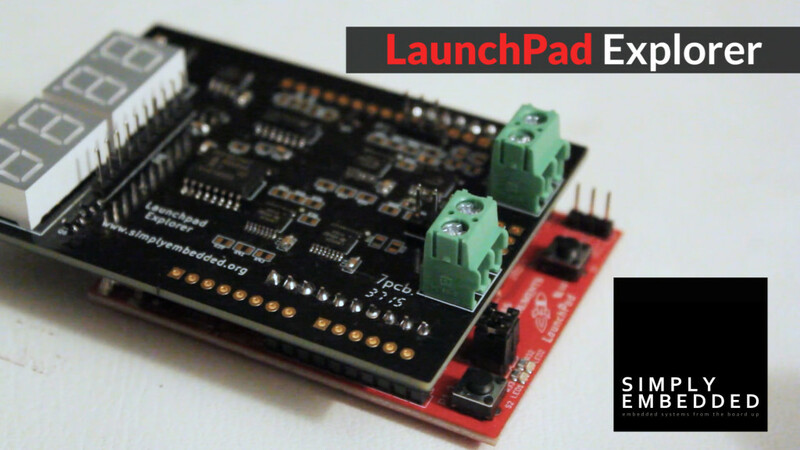 Exciting news today – the LaunchPad Explorer has launched on Kickstarter! If you haven’t heard, the LaunchPad Explorer is an educational BoosterPack we designed specifically to complement our tutorials. For more information and to support the project check it out here! Thank you for joining us for the unveiling of the LaunchPad Explorer! It has been a while that I wanted to have the option of using gdb instead of mspdebug. Don’t get me wrong, mspdebug is excellent, but sometimes it helps to have a bit more powerful and mature debugging tools. When I first investigated using mspdebug along with gdb in a server/client setup, I ran into a connection problem which I did not have the time or the desire to solve. I pretty much just gave up, that is until [yeltrow] wrote to me and told me how he got it working. He even has a nice write-up about it here. I couldn’t resist, I had to try this out ASAP. So I got to work following his instructions but unfortunately ended up with the same error. I updated my compiler to the latest version – still no luck. Finally, I realized that my mspdebug was version 0.22 while his was 0.23. Could this be it? 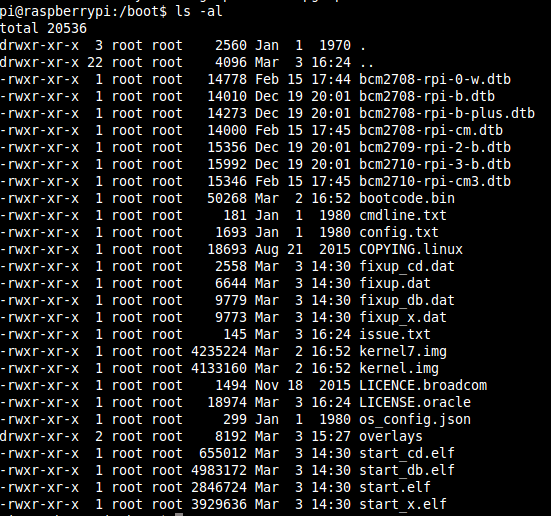 Well, turns out this latest version hasn’t been updated on the Ubuntu repositories. This time, I am not giving up. So I compiled it from source. Luckily it’s really quick and simple. After updating mspdebug to the latest version, success!! The makefile has been updated in the github repository so you can just pull and the changes will be there. Now we need to do a rebuild to make sure all the debugging information is included. Start mspdebug as we normally do and program the the application to the board. Instead of running the program from mspdebug, you will start the gdb server by typing the command ‘gdb’. This starts the server on port 2000 of localhost. The job of the gdb server is to translate gdb commands into hardware actions and communicate these actions to the hardware. Mspdebug is no longer the debugger, it’s really just a translation layer. The client, which is gdb, is the debugger. As with the rest of the toolchain, we must run the cross-compiled version under /opt/msp430-toolchain/bin. Passing the object file as an argument tells gdb to load the symbol table from that file. Now we can connect gdb to the mspdebug server and start running. The ‘continue’ command is the gdb equivalent to ‘run’ in mspdebug. 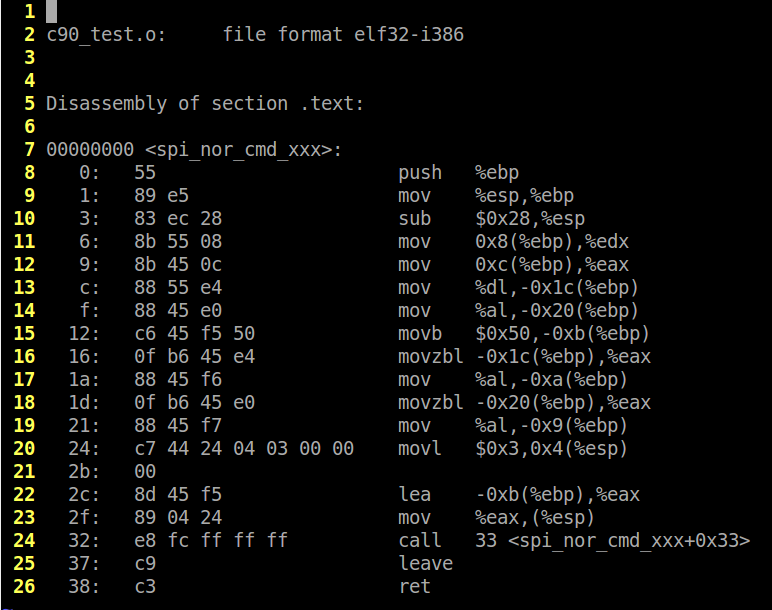 Now you can start using gdb to debug your code. If you are unfamiliar with gdb, I would start here and work through the ‘breakpoint’ and ‘continuing and stepping’ sections. Enjoy!